This content is sponsored by Sell My Timeshare NOW. Visit SellMyTimeshareNOW.co.uk for information about great deals on kid-friendly accommodation at ski lodges and timeshare resorts throughout France. Discover which resorts and towns offer the most family-oriented activities and attractions. 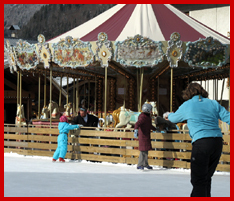 Kids filled the Morzine, France, Visitors Center. They were lined up like someone was giving away cookies, or something. But, no. They were painting faces. And, apparently, they painted faces every week at this time. Alright, face painting isn’t anything radically new. But, this was the first time I’d seen face painting in the lobby of a major ski resort's Visitors Center. But, come to think of it, in kid-centric Morzine, weekly apres-ski face painting wasn’t such a surprise. After all, just outside the door was a skating rink and a carousel. A carousel? Downtown in a ski town? That was just the first of many kid-friendly surprises I encountered while exploring three of France’s best ski resorts—Morzine, Chamonix and Megeve—under the guidance of Franceguide.com. At first, Morzine doesn’t look like much. From the rather small town, what you see is a lift going up a modest hill on one side of town, and a gondola that departs from a side street on the other side, crosses a small river and quickly disappears from view after ascending a short distance. It’s the disappearing that counts. Because small-town Morzine serves as the gateway to a ski region (or, "ski domain," as the French say) known as Portes du Soleil. Gateway to the Sun. The region contains 650 kilometers of groomed runs, and twice as much skiable terrain when you include off-piste. It encompasses 12 individual ski areas, served by 194 lifts and reaches into Switzerland. It was raining in town when we arrived. But, Portes-du-Soleil is big enough that low-altitude rain morphs into high-elevation snow. Led by ski school director Thierry Copreau, we explored happily splashed for two days in off-piste powder. One day, we even skied to Switzerland for lunch. But, don’t let the big mountain skiing fool you. This is really a small town. And, like many small towns, it’s pretty kid-friendly. Like I said, how many resorts operate a carousel in the town center? A Guide d'Animation is published weekly to publicize that week’s happenings. An official "family places" logo is printed in the calendar and at venues to indicate that those events are certified for family participation. The list of family-oriented events is remarkable. Some take place weekly: the parent sledge races on Fridays; face painting on Tuesdays. Some happen less frequently: the Carnival on holiday Tuesdays. Other options? Two ice rinks, indoor and out; Indiana Bob’s paintball; and night sledding on the ski hill. Got teens? Send ‘em over to one of the alcohol-free Teenager Soirees. And, to reduce the financial impact, Morzine's Family Package ski pass affords ten percent off each lift ticket for parents and two kids. On a tip, we wandered to an "uptown" hotel, La Bergerie. Family-friendly? Indeed. Here were all the requisites for a family stay: a heated outdoor pool; a game room; hotel rooms with kitchenettes; and, unique to me, a kids-only dining room with its own kids-only chef. But, what about kids’ skiing? No worries. The resort supports the French Ski School www.esf-morzine.com, plus three other privately operated schools (including the snowboard-only Mint Snowboard School www.mintsnowboarding.com). All instructors are multi-lingual; finding an English-speaking instructor or guide was easy. 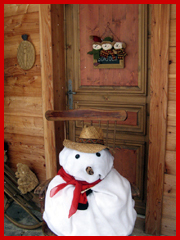 Indeed, being an Anglophone proved no problem in any of the French Alps resorts we visited. Nor, for that matter was finding appropriate children's on-snow programs and facilities. In Megeve, it was the horses. 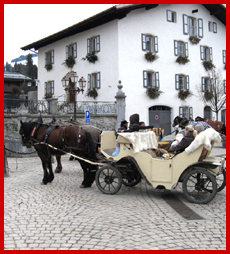 Big, beautiful steeds that were hanging around the town square just waiting to pull you for a sleigh ride. There wasn’t a kid in town who didn’t want to hop on board. If the idea of horse-drawn sleighs serving as taxis—or just plain apres-ski entertainment—strikes you as quaint, you’d love this town. True, too, if skiing as relaxed, wide open cruising is your cup of tea. Or, high-end shopping set in antique buildings, along with just enough family-oriented activities and excellent culinary choices. If it’s rip-roaring, double-diamond downhilling. Not here. Yes, the pistes spread over 300 kilometers. And, yes, many are rated black diamond. But, few force your heart into your throat. Rather, they elicit huge grins and cruising to your heart's content while surrounded by sensational scenery. We're talking about mountain ranges running off into the distance as far as the eye can see, yielding expansive views from the lifts, on the trails, from the decks of on-mountain restaurants and even through the windows of mountaintop toilettes. Megeve's high-end shops are housed in centuries-old, character-rich buildings. All the big outdoor clothing and equipment names are here, making prime time window shopping (or, wallet-draining real shopping). Must-do stops include Aallard, the world-renowned clothing maker/retailer and inventors, in the 1930s, of the stretch ski pant. And food at spots like Le Refuge du Boulanger, a national award-winning patisserie, or to-die-for, chocolates called Glacons that are only made and sold in Megeve. You can readily miss the tiny local historical museum, tucked away as it is on a side street. Don't. 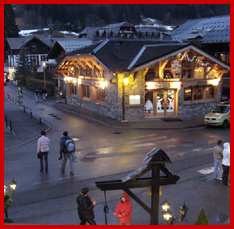 It's a great place to get a sense of Megeve before skiers arrived, when it was just a small farming village. The ultra-modern Sports Center, with its glass facade, is almost impossible to miss. Inside: ice skating, two swimming pools, saunas, fitness rooms, and indoor tennis, golf and a climbing wall. There's another outdoor ice rink at the center of town, as well. And, from right there, you can access 50 kilometers of footpaths suitable for winter hiking and snowshoeing. In case you're getting the idea that upscale Megeve might be a tad on the stuffy side, be advised otherwise. Events like the annual January on-snow polo competition and March golf tournament can't be anything but fun. And funny. We only stayed in Chamonix for a day. But, indeed, we came, we saw, and we conquered. 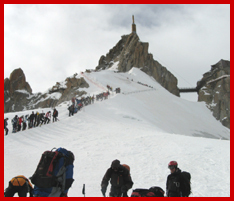 Conquered the legendary Vallée Blanche. This is not something you do lightly. And, it's only for advanced/expert skiers/riders. But, if you've got the skills, and the money to hire a guide it's a snowslider's right of passage. The Mer de Glace (Sea of Ice) glacier's spectacular vertical drop (8,400 feet), length (12.5 miles) and scenery, make the Vallée Blanche ski run one of the world’s greats. Still, the first thing I had to do was conquer my acrophobia. Because you start by taking two tram rides up to 12,500 feet and onto a ridiculously small rock pinnacle called the Aiguille du Midi. From there, you rope yourself to the others in your group, don crampons if it's icy, and hike for 20 minutes down a narrow ridge while clutching a safety rope with you-fall-you-die plunges on both sides. Heck, I could barely bring myself just to look where I was going. And I was petrified to look down. After the entry hike, it’s an all-day ski that takes you through vast snowfields, down steep faces, past sinister crevasses, alongside house-sized ice blocks, and through narrow passages, while dominating summits lord themselves over you all the way. Spectacular doesn't quite do it justice. Slightly more than halfway, we stopped at Refuge du Requin, a mountain hut tucked atop a rocky promontory, for much needed food and water. Yet, we couldn't dally too long. You must reach the glacier’s end before the last train departs for town. And, to reach the train, you must climb up more than 100 steps. I made it. I was elated. But, I was running on fumes. Beyond the Vallée Blanche, Chamonix holds three major ski areas with sliding for everyone and a town that feels like a miniature city. Paved streets, multi-story buildings, auto traffic (except on its main thoroughfare), a railroad station, an excellent museum called the Tairraz Centre that's built into the hillside and, or course, plentiful retail and dining, plus the expected ice skating, tobogganing and indoor swimming. But, it's the setting that's remarkable. Nestled in a narrow valley surrounded by towering, precipitous peaks, Mont Blanc rises on one side, wearing a white pate from which the winds send snow flumes airborne like a cowlicks gone wild. A shoulder ridge, dramatically spiked with ornate stone pillars resembling an ancient temple, reaches out from the peak. To the other side, rise more mountain walls, perhaps not quite as dramatic, but still frighteningly precipitous. Yet, skiing doesn’t define Chamonix’s spirit. The mountains do. Mountaineering traces its roots to this spot. And, it remains a prime destination for all high-elevation high-adventure seekers. That tradition is reflected everywhere: a flag at the guides’ office warns, by the color flown daily, of avalanche danger in the heights; stores sell any conceivable mountain play-related gear; adventure hounds move through town carrying skis, climbing ropes, harnesses, ice axes and crampons. This ski trip offered a lesson in international relations. You meet not just the French. People come from the world over to ski these legendary places. And, because these are legendary places, where snowsliding has been happening since way-back, it’s a lesson in skiing heritage. Exposing your children to the cultural experiences afforded by a ski trip through this heritage rich region is both a fun and rewarding family outing. If you plan to holiday here annually to experience the vast offerings of the French Alps, you may want to consider investing in a France timeshare at your favorite ski lodge or mountain resort. This is an economical way to secure prepaid lodging and alleviate some of the hassle of holiday planning.